Buddhism might well be divided historically by the students into the Rajgir, the Pataliputra, and the the Takshashila periods. Or we mightchoose for the names of our periods those monarchs who were the central figures of each of these epochs. At Rajgir these would be Bimbisara and his son Ajatashatru, at Pataliputra Ashoka, and at Takshashila Kanishka, the second sovereign of the Kushan empire. The epochs thus named would also be coterminous with the dates of the three great Buddhist Councils. No complete history of Buddhism could leave out of account the influence of the great Kanishka. For from his time, as we are informed by the Chinese travellers, dates that great schism of the Mahayana, or Northern Schools, which has carried with it China, Japan, and Tibet, while Burma, Ceylon, and Siam belong to Southern Buddhism, or the Lesser Vehicle. A great haughtiness divides to this day the adherents of these differet schools. To the Northern School belongs the new recession of the scriptures published by the Council of Kanishka. To the Southern belong the simpler and more ancient works, amongst which are included the three Tripitakas. 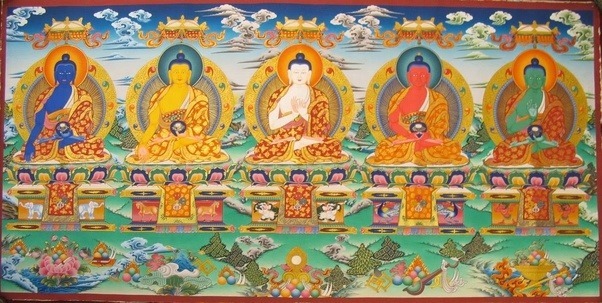 The characteristic doctrine of the Mahayana, according to the disciples of Hiouen Tsang in the early eighth century, lies in the veneration of the Bodhisattvas, along with the one earthly and supreme Buddha. The Southern School, or Hinayana, does not profess to invoke the Bodhisattvas. But it is easy to see that under this brief definition there is indicated a wide divergence of attitudes and teaching. Anyone who studies a religious movement which has its origin in an Indian and Hinduistic teacher, is bound to notice two opposite influences which come into play almost simultaneously. First there is the highly abstract and nihilistic character of the personal realisation of the Master himself. No gods, no forms, no rites, and the unreal and phenomenal nature of the world about him, all this is the immediate and strongest impression made on the mind. Heaven must not be thought of, perfection is the only possible goal for the soul. And so on. But at the selfsame moment, by creating a profound sympathy for India, and the Indian way of looking at the world, the door is opened to all sorts of complexities, and the disciple may well end by accepting a thousand things each as unthinkable as the one or two he originally abandoned at the call of a higher truth. This must always be the twofold effect of an Indian teacher of religion on a foreign mind. This very phenomenon we may which on a geographical scale in the history of Buddhism. Here the Southern countries, served byt he early missions, received a stricter and more personal impress of the deposite of faith actually left to his church by the Master.This system was atheistic, nihilistic, and philosophic in the highest and severest sense. Even in the reign of Ashoka we see the erection of rails, pillars, and Stupas, the glorification of holy places, and the worship of the sacred relics, but never a trace of the multitudinous extraneous elements which were later to be accepted.